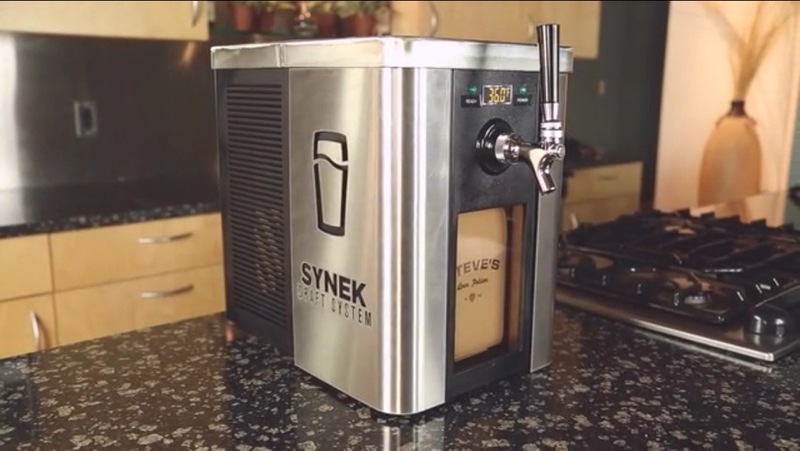 I received an email about a Kickstarter campaign that just launched for a home draft system. I thought I’d share it here for anyone who may be interested in this sort of thing. I personally really like the idea. For many people, this is an easier and cheaper option than purchasing a second refrigerator and setting up a standard draft system. The main drawback here though is that the system holds 1 gallon. If you are the type who likes growler fills, this is an awesome alternative: twice as much beer compared to a typical growler and a much better shelf life. However for homebrewers, only being able to package 1 gallon at a time may be too limiting, depending on your batch size. Ultimately, I would love to see something like this succeed. The more effort that is put into beer packaging technology, the better it will be for consumers in the long run. I think it would be awesome to go grocery shopping and while I’m there, fill up a gallon of beer to have available on draft at home for the next week. SYNEK has a very lofty goal of raising $250,000 in one month, so if you like the idea of this, be sure to spread the word. Keep in mind that there are still a few final design elements that are yet to be finalized (ie: refrigeration method). This is great, as it allows the backers to help with designing the type of product that they want to own, but it also could mean a delay in the the final product release. For more information, and to support SYNEK, visit their Kickstarter page here.